*All half-day tours include entry fees, parking and road tolls. *Transportation in A/C non-smoking car or minibus with professional English speaking guide and driver and their daily expenses. 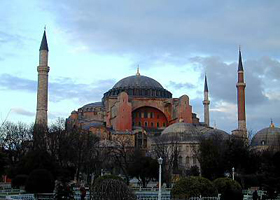 Dolmabahce/Beylerbeyi Palaces, Turkish and Islamic Arts Museum, St.Sophia, Military Museum. TUE Topkapi Palace, Military Museum.